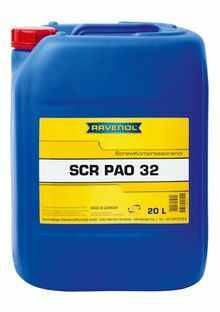 RAVENOL SCR PAO 32 Screw Kompressorenoel is fully synthetic compressoroil with ISO VG Class 32 which is specifically designed to provide effective lubrication in rotary screw air compressors. RAVENOL SCR PAO 32 Screw Kompressorenoel contains additivs, which ensure an excellent wear protection and protects against residue and corrosion (both steel and non- ferrous metal). Most compressors have to work under high temperature so that the used oil has to have a good aging resistance but also a low residue building. RAVENOL SCR PAO 32 Screw Kompressorenoel conforms to its ISO VG Classe and shows a remarkable low evaporative behavior an outstanding demulsifying power as well as excellent air separation ability. It ensures certain lubrication not only in the high temperature range but also in cold condition of the compressor to reach a wear minimisation. By the use of selected and matched additives the tendency of coking and flammable residues are minimized. RAVENOL SCR PAO 32 Screw Kompressorenoel is recommended for use in rotary screw air compressors. Best wear protection. Keeps compressor components free of sludge and varnish to ensure trouble free operation and lower maintenance costs on fluid change-out. Very low evaporative behavior and an outstanding demulsifying power. Better resistance to oxidative breakdown. Extends oil change intervals up to 8,000 hours service in rotary screw compressors and 1,000 hours service in rotary vane compressors.. Improves compressor operating efficiency, lower energy consumption costs by reducing of oil thickening.